It was the dotted, orangey-yellow and black stripes that stood out, drawing my son’s gaze to the edge of the sandbox. A small caterpillar clung to the goutweed, munching away on the green leaves. At first we thought it was a monarch caterpillar, but the stripes weren’t quite right. Out came the field guide, where we discovered our caterpillar to be a future black swallowtail butterfly. After that first discovery, we suddenly noticed more caterpillars, both in that patch of goutweed and on the greens of the carrots in our late-summer garden. The black swallowtail (Papilio polyxenes) is one of six swallowtail species found in northern New England–and one of more than 500 swallowtails species flitting about throughout the world. Before modern agricultural crops were planted, it relied on native hosts like water hemlock, water parsnip, and other wetland plants. The species has adapted to the changing landscape, and its caterpillar’s propensity for munching on members of the carrot (Apiaceae) family–carrot, dill, parsley, fennel–has earned it an occasional reputation as a pest and the nickname “parsley worm.” It’s also commonly found on Queen Anne’s lace. In our little garden plot, with plenty of greens to go around, the caterpillars became a happy curiosity rather than a nuisance. That summer we found so many of them we became careful in harvesting the carrots. We moved most of the caterpillars to other food plants, but kept a few in a makeshift cage with plenty of fresh carrot greens and long sticks for pupating. The cage allowed us a close up view of some of the ways that this species evades predators. Like its Papilionidae cousins, the black swallowtail has developed a number of defense mechanisms, changing its tactics as it moves from caterpillar to chrysalis to butterfly. During its initial two instars–or skin shedding phases–the caterpillar is spikey and dark brown, except for a white saddle that makes the little creeper look like a bird dropping. What bird would want to eat that? As the caterpillar bulks up, it develops the wavering yellow stripes, mingled with black and white ones, that first caught our attention. These stripes are a visual bluff, suggesting to predators that it may be toxic. Any bird that has tried to nosh on an awful-tasting monarch caterpillar is likely to eschew anything of similar coloration. A misleading appearance isn’t the black swallowtail’s only defense. 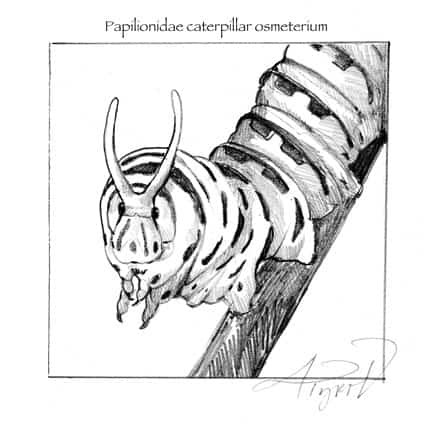 Like other Papilionidae species, the caterpillar uses another snazzy mechanism to ward off predators: an osmeterium. We noticed this forked orange organ emerging from near the caterpillar’s head (technically, its prothoracic region) each time we got too close. The caterpillars arch up as the osmeterium emerges, as if they’re curiously exploring their domain. To us, the osmeterium seemed jelly-like and harmless, but to smaller creatures–a bird, for instance—the osmeterium may look a bit like a snake’s tongue. This forked organ also releases a foul smell, the result of sequestered oils from the caterpillar’s host plants, which may be enough to deter smaller would-be predators like ants or spiders. Eventually, our caterpillars attached to the sticks we’d left in the cage, and we watched as they transformed into plain brown chrysalises, so well camouflaged it was difficult to distinguish stick from pupa. This is yet another defense. In our region, black swallowtails may have two generations a year. Caterpillars that pupate earlier in the summer create green chrysalises to blend in with a leafy background. Those pupating later in the season, as ours did, do so in autumn brown. The next spring, just as the first perennials were blooming in the front garden, the butterflies emerged. Velvety-black abdomens dotted with tiny white spots held scalloped wings that narrowed to slender tips. The dark wings of the male black swallowtail are banded with yellow. The female has, instead, a row of yellow spots, with a summer-sky blue band along the hindwing. An orange eye spot dots each hindwing, and several orange dots on the underside of the wings are visible when the butterfly’s wings are closed. The coloration of the adult black swallowtail offers a final protection; the female, especially, resembles its slightly more southern cousin, the pipevine swallowtail (Battus philenor), which is toxic to many predators. We only noticed a few black swallowtails this summer, and so far haven’t found any of their caterpillars or pupae. Still, we tread more carefully now through the greenery in the yard, peering closely at the carrot greens as we pull them from the garden, looking for that telltale flash of yellow that would portend the flight of a black swallowtail butterfly come spring.